Joey Katabi, who works at Carroll Street Food Corp on Utica Avenue in Crown Heights, offered a lighter to a solemn-looking man in a red sweatshirt. The man lit a candle which he placed at an impromptu memorial that has cropped up in front of the bodega for Saheed Vassell, a mentally ill man shot and killed by police on April 4. Returning the lighter, the mourner shook hands with a passing neighbor and rested a hand over his heart on his way out of the shop. Such displays of neighborly comradery are common in the Brooklyn neighborhood these days. 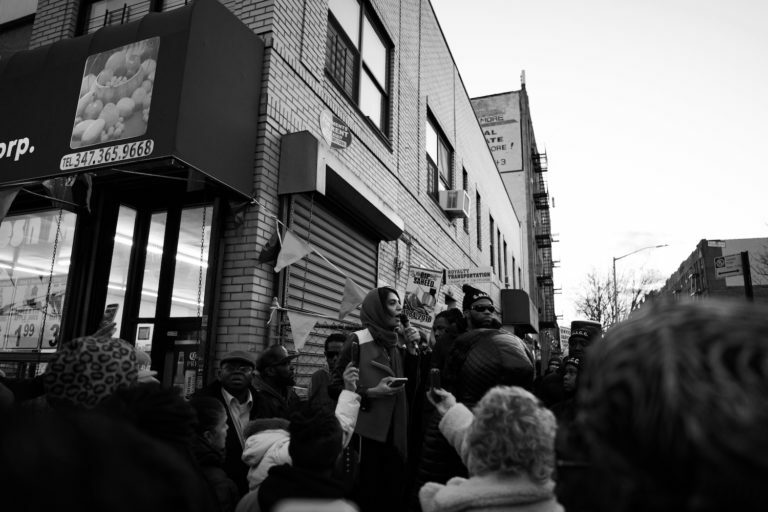 Earlier Thursday, a vigil for Vassell began at 4.40 p.m., the same time of day that he was killed on April 4, near Utica Avenue and Montgomery Street, two blocks south of the Carroll Street bodega. Officers were reportedly responding to three 911 calls from people concerned about a man with a gun, though two of the callers could not confidently say that the metal object Vassell was carrying was actually a firearm. In fact, it was a knobbed piece of pipe. Vassell had bipolar disorder and, according to Katabi, the 34-year-old often pretended to be holding a gun. 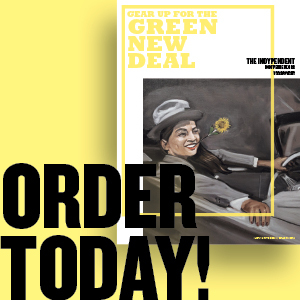 “He was always using his hands,” he told The Indypendent, “making guns as a joke.” Like Vassell, Katabi has lived in Crown Heights his entire life. The elder shopkeeper watched Vassell grow up and was still grappling with the shock of the loss of a face he had seen alive just days previously. The NYPD is the real threat to public safety, speaker after speaker proclaimed. Vassell was a well-known member of his Crown Heights community. His habit of pointing fake guns at people was a part of his playfulness, and his playfulness was a part of the way he interacted shopkeepers, restaurant workers and with his neighbors. Local patrol officers had taken him home or to the hospital on several occasions in the past. But only someone familiar with the neighborhood dynamics would have understood that. The speakers at the vigil, which gradually became a protest and eventually a march as the sun set Thursday evening, said that the 911 callers and the responding NYPD officers were not members of the community. After each speaker finished, chants of “No justice! No peace!” rose from the crowd. Community activist Linda Sarsour, the former director of the Arab American Association of New York, demanded that the NYPD fire every officer involved in the shooting. Earlier in the day, Mayor Bill de Blasio suggested that the public imagine what would have happened if Saheed actually had a gun. “[T]hat’s a split-second matter of trying to save lives right then and there,” he told CNN. 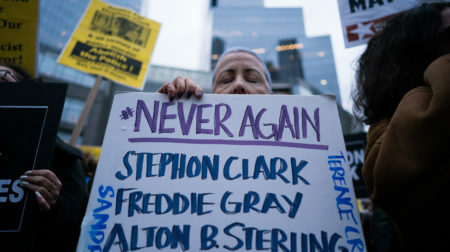 But protesters on Thursday were tired of the repeated criminalization of the NYPD’s victims. “We are strong enough and independent enough to police ourselves!” a woman hollered into the microphone. The vigil was wary of journalists, some of whom were crowding close to the speakers and not giving Vassell’s family room to stand on the platform. “Media, I know you want the news but we’re trying to get the family up here so you don’t have to visualize what they look like,” one activist acidly chided the reporters. Vassell’s brother Marcus Vassell told supporters what a warm person Saheed was. Photo: Crown Heights residents protesting Saheed Vassell’s killing on Thursday. Credit: Erin Sheridan.